What you have in front of you, is a support page for the Samsung GT-I9250 which has been rumored for weeks to be the Nexus Prime. Confused after reading that? Oh, because the rumored “DROID Prime” is listed all over the place now as being SCH-i515? Yeah, this isn’t going to be easy to explain, but we’ll try. Our opinion still basically reflects what we said throughout a variety of posts yesterday. The device that is headed to Verizon may not actually be a Nexus, but still could be the first stock Android 4.0 device on the planet. Just like Verizon did with the XOOM (and 3.0) and original DROID (and 2.0), they could easily release this device and not make it a Nexus which is why you are seeing the Big Red-esque SCH-i515 model number. 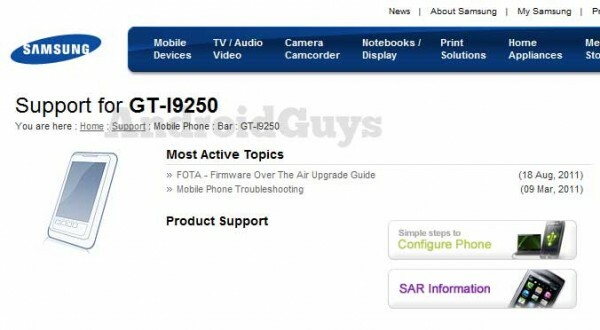 This GT-I9250, which matches up much more closely to say the Nexus S as far as model number goes than the Verizon version, is more than likely the next Nexus. That make sense? Now, that’s all speculation on my part, but the theory at least matches up to history. The good news is, that even if Verizon releases a non-Nexus version, there is a chance it could be completely unlocked, just like the XOOM was/is.